"Athletes seek help finding colleges; are recruiting services the answer?" "Author and Basketball Mom Offers Five College Sports Recruitment Tips"
"The Write Stuff: Laurie Richter"
"Athletes offer tips on the recruiting process'"
"Game on with college recruiters'"
"Richter's book on recruiting 'hits the nail on the head'"
"Passionate Mom turns frustration into recruiting book"
"The greatest compliment to Laurie Richter's book for parents concerning college recruiting is that our coaches--the guys who have spent years doing this--found it to be a solid road map of the "how to's" of the business. It is accurate, fair, and gives valuable insight to parents and young people who are making one of life's most important decisions for a college-bound athlete. I have always said that recruiting is like dating, and you need to know all you can about a person before you get engaged. This book helps you figure out how to do that." "Put Me In, Coach has a lot of great info. It will help the student athlete who wants to get recruited better navigate a process that has become a lot more complex than it used to be." "From a coaching perspective, recruiting is an inexact science. This book provides a refreshingly accurate and honest assessment of the recruiting process and solid advice on how to manage it. Sports and educational opportunities are plentiful, but finding the 'best fit' scholastically, athletically, and socially should be the primary goal. This is an excellent guide." "WOW, what a comprehensive and accurate assessment of the situation. It is a great help in understanding how the system works from scholarship programs to non-scholarship programs, and how to find the best athletic and academic fit. It provides a logical approach to the confusing and complex process of athletic recruiting." 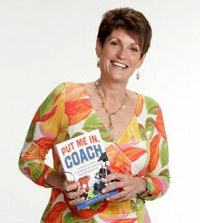 "Every parent who has a potential student-athlete should read Laurie Richter’s book, Put Me in Coach. She has written a book that will help parents and their siblings to make a good, sound, wise decision on which college they should attend. It will help parents and children to create a game plan so that a great college choice can be made. Well done, Laurie. You hit a grand slam home run with Put Me In, Coach!" 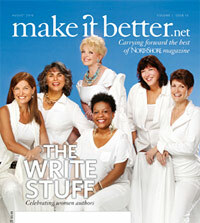 "In Put Me In, Coach, author Laurie Richter asks all the important questions many forget to ask. As a coach, I wish this were written over a decade ago. A must-read for all coaches and parents that are pursuing college athletics for their players. I recommend it highly and sincerely. 4 stars!" "Put Me In, Coach is the most complete, concise, and simply written book on the complex subject of college recruiting that I've seen. More important, it presents a structured, logical approach to sorting out the factors to be considered when choosing the school your child will attend. Well done." "Every parent of a high school athlete who wishes to play at the college level should have a copy of this book. It is the most complete, comprehensive, and timely book on the subject that I have read." "Put Me In, Coach is a must-read for any parent that is unsure or has any questions concerning the college selection process. It takes this complicated process and breaks it down to manageable steps that can be easily followed. Choosing a college, meeting new teams and coaches should be a fun and rewarding process, and this book highlights those areas." "What a book! This 'how to guide' sheds light on many misconceptions about the recruitment of the high school athlete. It’s a 'top notch' look at navigating the search process for parents, and gives coaches a great resource to help student athletes." "Put Me In, Coach is a must-read for anyone who seeks to unravel the complexities facing high school athletes in their quest to compete at the college level. Enlightenment and insight abound on topics ranging from the nuts & bolts of eligibility to the nuances of recruiting. Best of all, the book promotes and elevates the ultimate goal of every school counselor working with college-bound students...finding a fit! Every successful athlete knows the importance of preparation. Put Me In Coach prepares student-athletes to tackle one of the most important and exciting decisions of their young lives." "There’s a real paucity of material for the secondary athlete, the one who’s good enough to play in college but isn’t really one of the top athletes in his area and isn’t going to be recruited extensively by coaches near and far. There’s really no guide for parents to know what to do in that situation. We learned the hard way that it’s very difficult to find out where the opportunities are and what kind of steps should be taken. Put Me In, Coach does it for you by spelling it out and listing all the details and all the options, identifying all the issues someone would want to see and really solves the problems of a parent who has this secondary athlete and makes it much easier to know what to do with the whole college game." "This book was a lifesaver. By spring of senior year, we were unhappy with our options and running out of time. We followed the suggestions in the section about marketing your child, and ended up with a scholarship. I wish we had read the book a few years earlier." "This book is the must have inside guide for any parent trying to get their talented athlete into a good college hopefully along with a scholarship. Laurie Richter manages to take a large complex process and break it down into digestible and understandable chunks. While this book may not be able to guarantee that your child get into a great school on a full athletic scholarship, if you follow the immensely practical information provided, it will save you time, money and maybe even a headache or two." "Students who are good high school athletes and hope to play in college have even more of a challenge with the college search process. For parents of these students, Laurie A. Richter's book can help. The author outlines some of the difficulties that student-athletes face, and suggests that the first step is for parents and students to be realistic about where they can play. Richter offers stories of students who found a place at D-I, II, and III schools, and statistics about how many high school athletes actually make college teams." "No one's going to get noticed sitting on the bench. Put Me In, Coach: A Parent's Guide to Winning the Game of College Recruiting is a hands on high school athlete parent's guide to helping their child get the chance they need to win that prestigious sports scholarship. Advocating starting as early as possible, it's an athlete's guide to preparation for college. 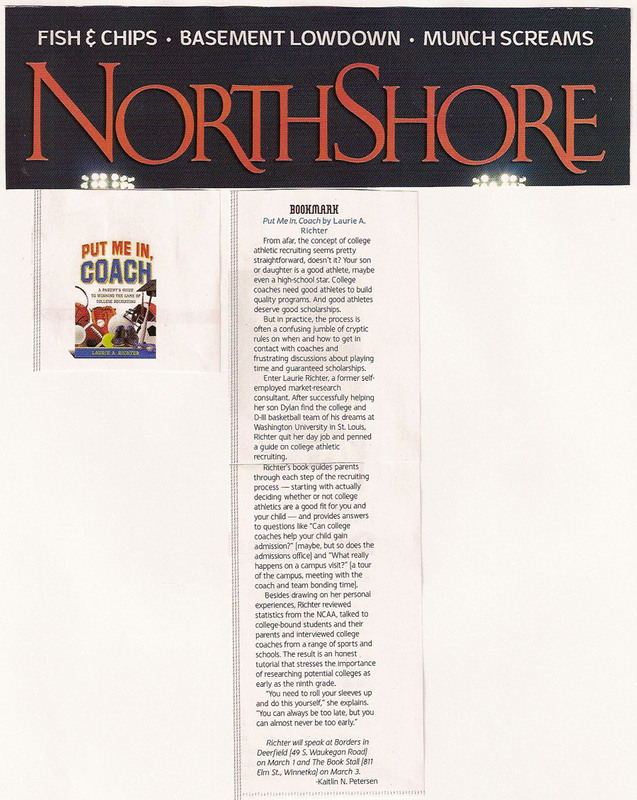 A complete and comprehensive manual to the path to college athletics, Put Me In, Coach is invaluable."